Tyson Fury sparring a featherweight in a gym session that literally saw a David vs Goliath encounter between two pro boxers. Obviously Fury did not go full steam. Dear lord, if he did – serious health consequences would have ensured. But he did step in there and move around with “Kid Galahad” in a hilarious video where Fury lets Galahad go for him while Fury works on his reflexes, defence and movement. Credit to Galahad for getting stuck in against a man who literally outweighed him well in access of double his own body weight. Possibly close to treble his weight in reality. 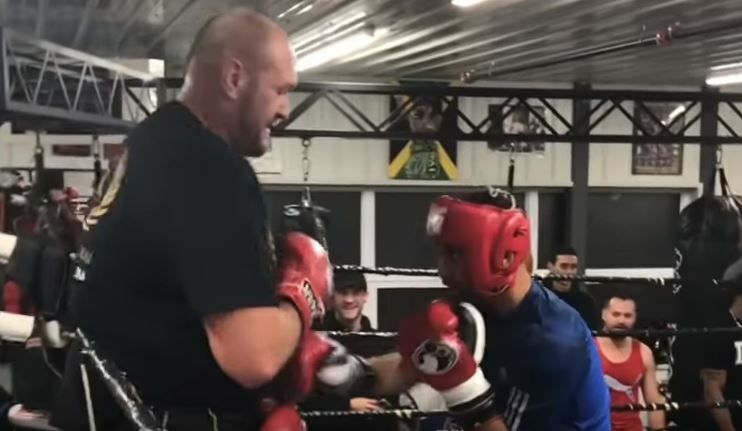 On a more serious boxing note for Fury he continues to shed the pounds slowly but surely, week by week – ahead of a comeback to the ring in 2018 that will no longer see him using his old trainer and uncle Peter Fury. Tyson confirmed the news yesterday saying there was no fall out with his uncle but he was just looking for a change.